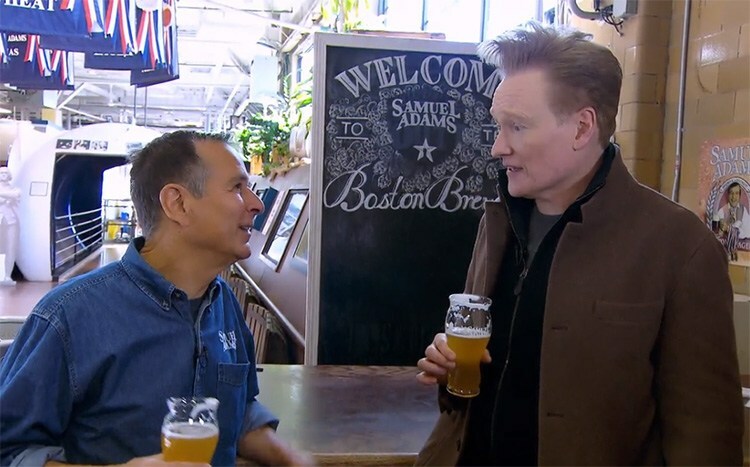 Conan O’Brien is decidedly not a beer aficionado. But that didn’t stop him from taking a tour of the Sam Adams Brewery during a recent visit to his hometown of Boston. The late night host’s reactions during this segment will resonate with anyone who’s ever been painfully bored while either taking a brewery tour, or talking shop with a bunch of beer nerds. This week’s brewery tour and last week’s visit to Olive Garden suggest that perhaps O’Brien will be focusing a bit more on the food and drink world with the latest installment of his late night show, which returned for its ninth season this January. Last week, after a three-month hiatus, “Conan” returned, for its ninth season on TBS, as a late-night show stripped down to its essence. It’s running time is now a half hour. The monologue is trimmed down enough to qualify as brief remarks, which is good, as O’Brien has a limited appetite for topical comedy. The show will probably lean more heavily on outside-the-studio segments like the Sam Adams tour, and will perhaps focus a bit more on the food and drink world as well. Watch the entire brewery tour in the clip below.